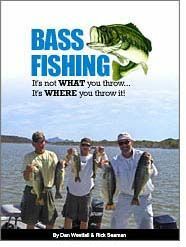 An 80-page bass fishing book that tells where bass are located throughout the season and outlines their daily movements. Download the PDF version now. The best gift for bass fishing enthusiasts. Learn why the pros consistently catch bass while most bass anglers often struggle. Learn where to find bass every time you go to the lake. Improve the quantity and quality of your catch. That's the message of the book. Bass are easy to catch once you find them, but most anglers have a difficult time locating bass. This book focuses on where to find bass. Once you know where they are located we offer proven techniques for catching them. Additionally we offer precise recommendations for dealing with weather variables like wind, fronts, cold spells, bright sunny days and more. You can download your copy right now and instantly begin learning the most important secrets about bass fishing, ever published. Download your 8 1/2" x 11" PDF version immediately! In print this book will retail for $29.95. We are offering advance copies of the book as a PDF, for immediate download, at only $9.95 - that's a $20.00 savings. Do you ever wonder why the pros, when interviewed, talk about WHAT they threw to catch bass? They do so to avoid talking about the details of WHERE they worked the bait. For some, they talk about the WHAT because their sponsors pay them to. Our tournament days are over. We don't have to keep secrets about where and how we found the fish. We no longer have lure sponsors to keep happy. We would appreciate the opportunity to share what we have learned over decades of bass fishing in all kinds of water. The title of this book is "Bass Fishing - It's not WHAT you throw, it's WHERE you throw it". You'll be surprised to find that you have been within casting distance of schools of bass while you couldn't buy a bite. Find out why, so you can avoid it next time you are bass fishing. Dan Westfall is a professional angler, lure inventor, lure manufacturer, fishing guide, tournament fisherman and Bassmaster Classic qualifier. Rick Seaman is a professional bass fisherman who has won numerous bass tournaments throughout the Southwest. Together Dan and Rick have over eight decades of bass fishing experience. If you want to learn how to find bass, this bass fishing book offers simple approaches for you to apply and find bass on your local water. These principles also apply to waters you are fishing for the first time. The reason we decided to write this book is to offer anglers the insight we wish someone had shared with us when we first started bass fishing. There are many bass fishing books on the market touting virtually every technique, lure, color, approach, tip, idea, and what have you. Each offers some very good information about bass fishing. Most offer a lot of filler to make the book look bigger on the shelf. We decided to keep this book simple, direct and to the point - describing what the bass are doing at various times of the year. Understanding what they are doing makes it so much easier to figure out where they're doing it. We also list the best methods and lures to use at each of the seasons defined in the book. We released this bass fishing book online so it can be downloaded for only $9.95. ORDER NOW for immediate download! Bass fishing lakes, by state. Buy your copy of the bass fishing book now! The ultimate book about how to find and catch more bass every time you go fishing. Become a better bass angler for less than the price of a couple lures! The life cycle of bass. A bass book about how to find bass.